Lightweight, portable 8-track digital multitrack recorder. 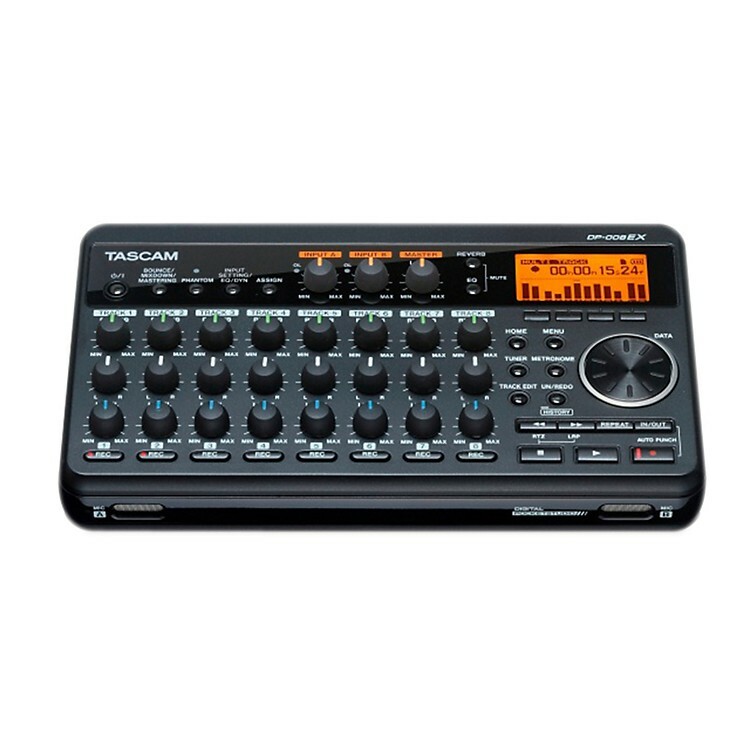 Portable digital recorders are a necessity for all songwriters, and the TASCAM DP-008EX Digital POCKETSTUDIO is a great choice. Jot down all of the key components to your songs using this professional sounding multi-track recorder. Be ready wherever creativity strikes. The DP-008EX comes with two condenser microphones built directly in the front of the unit so you can record vocals or acoustic guitar anytime without the need for extra equipment or setup time. TASCAM held many evaluation tests to secure the best sounding microphones and structures. Modeled after the top-selling DR Series microphones, you can be assured you're receiving top-quality. Moreover the DP-008EX was designed with a tripod mount for versatile set-up and placement. The DP-008EX is designed for on-the-spot recording. No unnecessary features were included that might complicate the recording to ensure easy functionality. Designed with analog functionality and dedicated control knobs the DP-008EX POCKETSTUDIO is one of the simplest to use songwriting scratchpads on the market. Carry It with you everywhere in your gig bag. The DP-008EX features ultra lightweight designs to ensure portability. It weighs in at only 360g (without AA batteries). Two Analog Inputs for External Mics and Electric/Acoustic Guitar, etc. The DP-008EX has two input terminals by phone-jack, these terminals provide to connect an external microphone, an electric-acoustic guitar and a line-level device like a synthesizer. Alternately with the help of a conversion cable you can connect a tablet device like the iPad (conversion cable is not included). Both models record to widely available SD/SDHC card media (2GB card included). In addition, both models can connect to PCs via USB2.0 for high-speed data transferring. All song ideas can be transferred via USB or SD card readers to and from the units at any point in the recording process. Files can be used in correspondence with DAWs. The DP-008EX is designed with insert effects for all input channels. Insert effects include EQ, compressor, de-esser and exciter. For vocal recording, you can use the EQ to boost your desired frequency range, and compress your tracks to normalize your song. Demo song needs the same high-quality as final masters. The DP-008EX has separately adjustable 2-band EQ for each track. Hi-range EQ can be adjusted from 1.7kHz to 18kHz, Low-range EQ can be adjusted from 32Hz to 1.6kHz. The DP-008EX has six different types of reverb to help tailor your ideal sounding vocals to any style song. Easily set your reverb with dedicated control knobs for each track. Reverb effects include: Hall1/2, Room, Studio, Plate1/2. Reverb time and master level can both be adjusted. The DP-008EX's built-in mastering effects will provide high-quality master-like file creation. The mastering effects include 2-band EQ, Multi-band compressor and Normalize effect. Finalize dynamic and powerful sounding songs by utilizing the DP-008EX's mastering effects. Anyone using the DP-008EX can easily master tracks with the Auto Analysis Mastering tool. In one step, select a mastering style, NATURAL or MAXIMUM, then the DP-008EX will make the calculation based on analysis of the song data. Be prepared whenever inspiration strikes. Order the DP-008EX today. Battery life (app. ):	Up to 9 hrs.